A Voice for the Child' offers an unprecedented treasure of the personal insights and rich wisdom of Janusz Korczak, one of the world's greatest authorities on children. During his lifetime he was both renowned and loved, as a doctor, writer, teacher, broadcaster, philosopher and fighter for the rights of the child. 'This collection of one hundred quotations and passages from legendary educator Janusz Korczak offers valuable advice and observations on how to take care of, respect, and love every child - from understanding a newborn's mysterious behaviour to answering the outrageous questions kids ask to confronting the conundrum that is adolescence. Sandra Joseph is a child psychotherapist living in London. "We all have heroes. Janusz Korczak is one of mine. He was undoubtedly a very brave, caring and charismatic man who understood children well and who had a life-long affinity with children. His words resonate across the years and have amazing modern-day relevance. Read more..
Over 100 excerpts in "A Voice for the Child" reveal how closely he understood the mind of the child. He pioneered what is now considered a basic tenet of child psychology, that the treatment a child receives when young will influence the way he later behaves. A wonderful little book which everyone who works with children will love, giving the personal insights and wisdom of Janusz Korczak, who during his lifetime (1879-1942) devoted himself to the needs and plights of children regardless of nationality and religion, and is renowned and loved as a doctor, writer, teacher/educator, broadcaster, philosopher and fighter for the rights of the child. What About The Children A new book of quotes will be published by Thorsons next month entitled "A Voice for the Child" based on the philosophy and writings of Dr Janusz Korczak one of the world's pioneers for the rights of the child. An inspirational book is spreading the word about the writings of Janusz Korczak. Sandra Joseph, the editor says, " I hope that as a result of this book people in the UK will be stinulated to learn about his educational theories, which are known and studied in many European universities." An inspirational book is spreading the word about the writings of Janusz Korczak - one of the world's leading pioneers for the rights of the child. 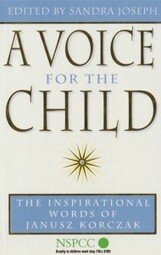 "A Voice for the Child" is a collection of the personal insights and wisdom of Janusz Korczak, one of the world's greatest authorities on children. During his lifetime he was renowned as a doctor, writer, teacher, broadcaster, philosopher and fighter for the rights of the child. "A Voice for the Child" offers an unprecedented treasure of the personal insights and rich wisdom of Janusz Korczak, one of the world's greatest authorities on children. This book is a fitting tribute to Dr Janusz Korczak. Through his work the reader gains a wondrous insight into the mind of the child. This is a charming book which gives real insight into the mind of the child. A Voice for the Child is a work of rare depth and beauty. Thank you for making available the words of a true giant of insight and compassion!"